A dairy product that is made from cream with a fat content of 30 - 60%%. Cream cheese is soft and tangy to taste, and is regularly used to make dips, spreads and the infamous cheesecake. Choosing: Check the expiration date first on the packaging. If odor develops, do not buy cheese. Buying: Cream cheese is commonly available in the dairy section of most grocery stores. 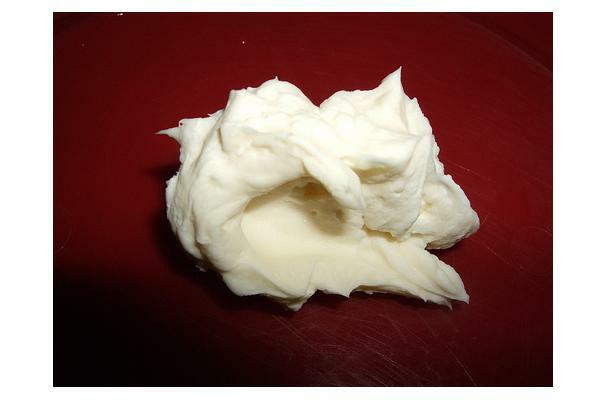 Cream cheese is widely used in spreads, dips, and in baking, especially in cheesecake and as a filling for fruit tarts. Cream cheese spreads or dips may be seasoned with herbs, spices, onions, olives, pimiento, relish, pineapple, or walnuts, or may be combined with such seasonings as caraway seeds, garlic, and sour cream. These various flavors are especially enjoyable with vegetables, fruits, and breads. Interesting ways to use cream cheese include horseradish-seasoned cream cheese in stuffed tomatoes, and cream-cheese sauce for shell-shaped pasta. Cream cheese is sometimes mixed with other cheeses—for example, the intensely flavored blue Italian cheese Gorgonzola—to create savory spreads and hors d’oeuvres. * Keep refrigerated — do not open until ready to use. * If cheese develops an off odor, flavor or appearance, it should be discarded for quality purposes; if mold appears, discard the entire package. * Unopened cream cheese sold in foil-wrapped block may be frozen in its original packaging. * Frozen cream cheese may become crumbly and lose some of its flavor; the thawed cream cheese will be best suited to cooked dishes, such as sauces, soups and casseroles. History: In 1872, cream cheese was invented by American dairymen, William Lawrence of Chester, N.Y., who accidentally developed a method of producing cream cheese while trying to reproduce a French cheese called Neufchatel. William Lawrence distributed his brand in foil wrappers from 1880 under the name of the Empire Company.